I was short on time this year at the LA Auto Show, so I had to do a bit of a blitzkrieg. The one booth I have to visit every year is Porsche because the cars are simply awesome. 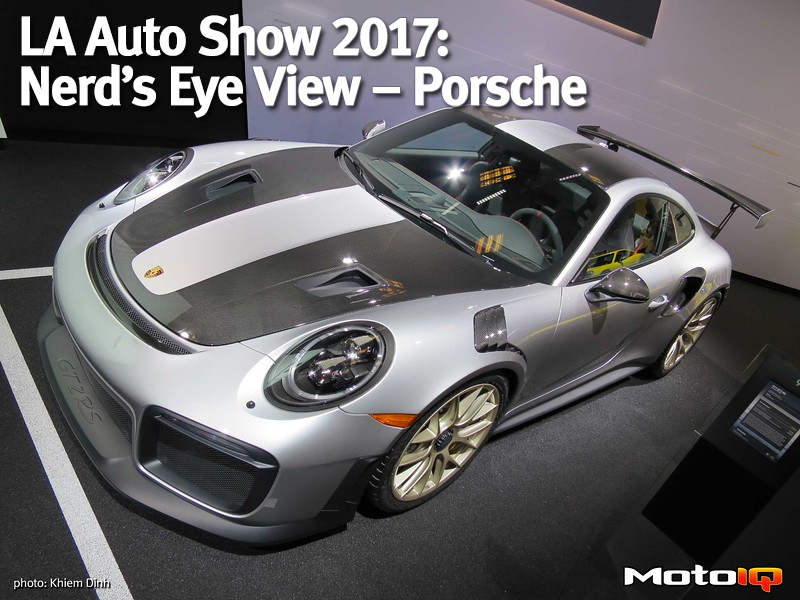 In addition to the GT2RS, Porsche was highlighting the Cayman and Boxster GTS siblings, 911 Carrera T, and a few 4-door sedans. I got sucked into the GT2RS and almost completely ignored all the other cars. Okay, just a quick glance at some of the 4-doors. 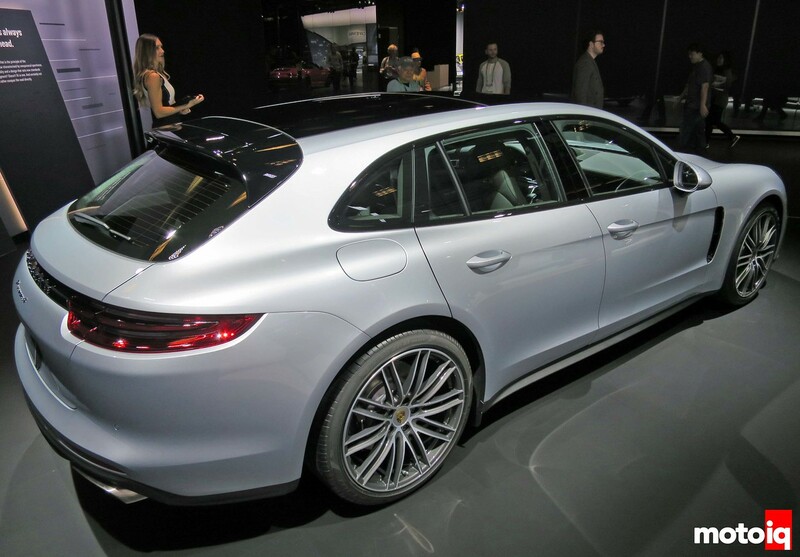 Porsche is hyping the hybrid stuff, probably because of their parent company issues with Diesel Gate. All the hybrids get the neon snot colored brake calipers and decal highlights. 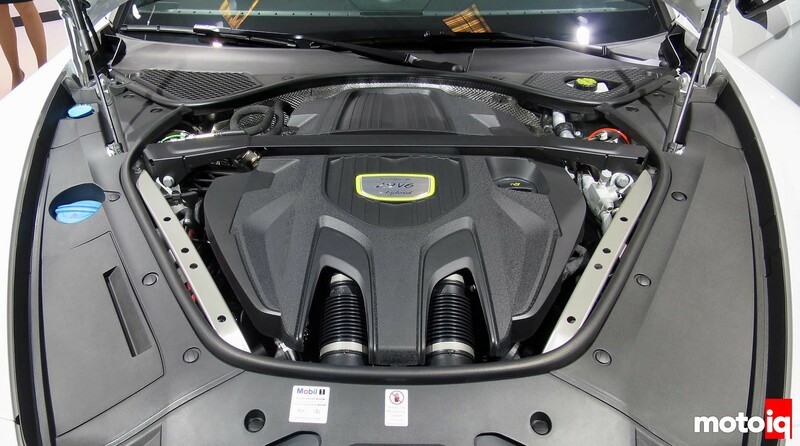 This Panamera hybrid has a twin turbo, 2.9L, V6 under the hood along with plastic covering just about everything. The center placard has the neon snot outer highlight to remind you the car is a hybrid. The turbos do appear to reside under the central plastic engine cover assuming those two black tubes are air intake tubes to the compressors. There is a ton of heat shielding on the back firewall indicating that’s where the exhaust comes out of the turbos. 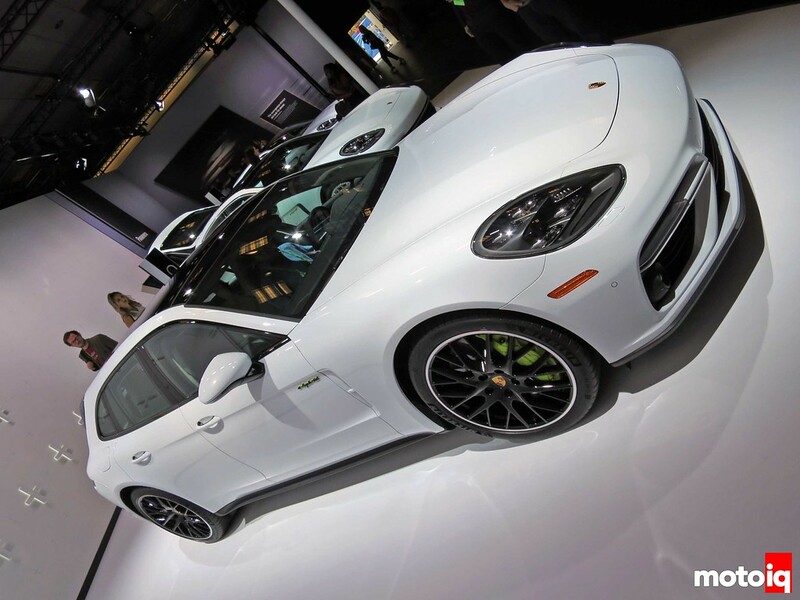 This is a Porsche, so even though it’s a hybrid, that doesn’t mean it’s slow. The engine and electric motor have a combined torque output of over 500 lb-ft and the car does 0-60 in 4.4 seconds. 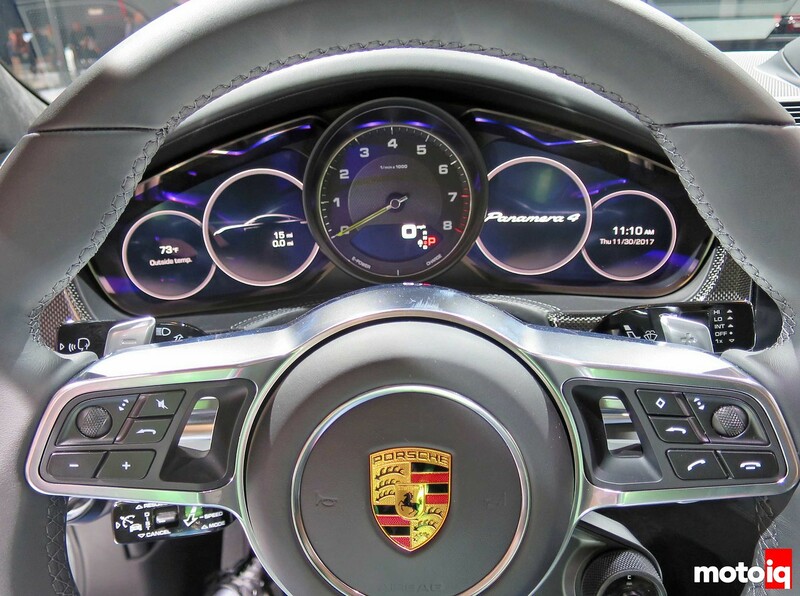 Porsche does it right with the tach right smack in the middle and big. Even in their sedans. And, it still has flappy paddles for manual shifting. You do have to memorize all the buttons on the steering wheel though. There are sooooo many buttons on Porsches, especially on the center console, I don’t get it. They probably have more buttons than a 787 Dreamliner cockpit. I’m really digging the Sport Turismo body shape. Maybe because I’ve always liked hatchbacks and this is a bit of a morph of hatchback and wagon. There’s a spoiler at the rear of the roof doing aero things and I love the look of the front fender vent.